Chuck Findley (born Charles B. Findley, 13 December 1947, in Johnstown, Pennsylvania, USA) is an American session musician. Most widely known as a trumpet player, he also plays other brass instruments such as flugelhorn and trombone. 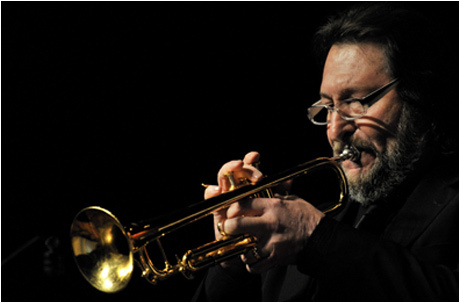 His technical abilities and versatility are renowned even among other session players, with the celebrated session horn player and arranger Jerry Hey saying “Chuck Findley can play anything”. A graduate of Maple Heights High School in Ohio in 1965, and the Cleveland Institute of Music, Findley’s first professional work was with the Jimmy Dorsey Big Band before joining the Buddy Rich Band on a world tour. In 1989 he joined the Tonight Show band led by Doc Severinsen. He was also a member of the band on The Tonight Show with Jay Leno from 1994 to 2001. A regular collaborator on recordings by artists such as B. B. King and Steely Dan, he has also played and/or recorded with Nancy Sinatra, Miles Davis, Stanley Turrentine, Toto, Pat Boone, Christopher Cross, Jaco Pastorius, James Last, Lee Ritenour, Jackson Browne, George Benson, George Harrison, Elton John, Carole King, Rickie Lee Jones, Joni Mitchell, The Rolling Stones, Dionne Warwick, Diane Schuur, Tom Waits, Randy Newman, Tina Turner, Al Jarreau, Sarah Vaughan, Narada Michael Walden, Buddy Rich and many others. Findley also often collaborates with his brother Bob, another trumpet player.